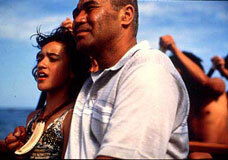 Arriving in general release after winning an impressive trio of major film festival audience awards, Niki Caro’s soapy family drama Whale Rider possesses so few distinguishing characteristics that ballot box stuffing seems the most likely explanation of its previous success. Set on the eastern coast of New Zealand, the film immerses itself in the home of a modern household of Maori tribespeople, but lacks much in the way of exoticism until it plunges headlong into New Age hokum. The encroaching tide of globalization threatens to expunge the last vestiges of the Maori way of life from the planet, but the more pressing matter for the family in the film seems to be finding an heir to become their tribe’s new chief. In the opening scene, narrator and granddaughter of the chief Pai is born, but unfortunately her birth brings with it the deaths of her mother and twin brother, leaving the patriarchy without an heir. Ten years later, the situation hasn’t improved. Pai’s father is now an expatriate and no new successor is likely to appear. Worse still, Pai’s grandfather, the aging chief, is desperate to find a worth chief and is deeply resentful toward the young girl, whose birth he considers a bad omen. Though the film wants to convince us that the culture that encourages him to foster that rage is worth preserving, in order for it to survive, it needs to adapt, and from those growing pains, the what little drama that’s mustered arises. Though Whale Rider bends over backward to convince its audience that these people are incredibly noteworthy, the characters we meet feel just like the generic people in every other ethnic drama and seem to have little distinctive local color about them. There's the plucky youngster who helps the elders rediscover their heritage, the hardheaded patriarch, the sassy grandma (“You can barely see your bum in those pants!”), and so on. As the clan faces off against one another is a series of stilted, somber confrontations, the movie goes through the motions of the genre, but in focusing so intently on the little girl’s empowerment through her crowning as a figurehead leader, it places the battles between feminism and tradition before the larger concerns that threaten the tribe. Its mystical ending, with its copious footage of whales, is supposed to elevate the proceedings to the realm of the fable, but instead it only further buries any real world concerns that might have been previously unearthed. Though it’s obviously presenting a different tract, there’s no missing that it lacks the political immediacy of Once Were Warriors, the last fictional film featuring Maori people to make it the American theaters. 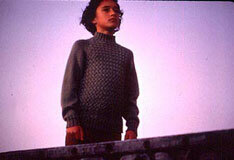 Whale Rider tries for a somber tone that it can’t maintain, partly because the cute protagonist conveys no gravity and partly because it’s too frequently going for laughs or stupid melodramatic crises. When the camera pulls in for a close-up so that tears and the score can simultaneously well up, the movie is simply maudlin. Though the modesty that it frequently demonstrates (there’s a climactic children’s talent show, for example) is admirable, it is an ill fit with the movie’s mythic overtones. Like last year’s Atanarjuat, Whale Rider finds its roots in the folklore of the people that star in it, and I imagine that those who enjoyed that overrated Eskimo epic will find plenty to like here, even though the scale and sense of otherworldly wonder have been considerably reduced. For the rest of us, it’s bound to feel trivial.